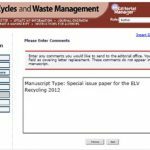 We are pleased to invite you to submit a manuscript for Special Issue of Journal of Material Cycles and Waste Management (JMCWM) on the 4th 3R International Scientific Conference on Material Cycles and Waste Management (3RINCs) 2017. The first issue of our journal, JMCWM was published at the end of October, 1999, and the latest issue, Vol.21, No.1 has been published in Jan. 2019. Vol.22, No.2 was the 5th 3RINCs 2019 special issue of JMCWM. At the beginning we started to publish biannual English journal, and from Vol.11 it became quarterly. In 2018 JMCWM was obtained IF: 1.693 in Journal Citation Reports by Thomson Reuters. The submitted manuscripts should be significantly enhanced and updated from the original short abstract published in the proceedings of the 5th 3RINCs 2019. Please note that only manuscripts containing data and information beyond the material presented in the proceedings of the 5th 3RINCs 2019 will be accepted for publication. All manuscripts for the 5th 3RINCs 2019 special issue of JMCWM will be subject to follow standard rules and review process for peer reviewed papers; including the review of each manuscript by at least two international experts. The deadline for paper submission is extended to April 30, 2019. The accepted papers will be published at the end of April or July, 2020 (Volume 22). There will be no page charge for authors in the 5th 3RINCs 2019 special issue of JMCWM. Color illustrations will be accepted; however the author will be expected to make a contribution to the extra cost. 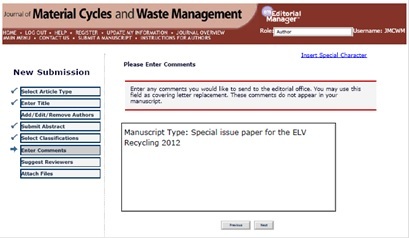 Instruction for Authors is available at JMCWM site on Springer Link. You find the other information for submitting and publication. Your specification to submit for the Special Issue o f the 5th 3RINCs 2019 should be appreciated. Please mention thereon in space of Author Comments, as shown in the figure. We are looking forward to receiving your manuscripts. It is our mission to promote proper waste management and spread the concept of the 3R principle (Reduce, Reuse, and Recycle) in our societies. The basic concept of 3R is to establish a sound Material-Cycle Society and at the same time aim to preserve resources and control hazardous substances. The aim of 3R International Conference is to provide and serve as a platform for academic activities that promote a 3R society. It is essential to strengthen mutual ties and have interdisciplinary discussions. We are holding the 3rd 3R International Conference on Material Cycles and Waste Management as an open academic platform. We are calling for scientifically and academically based presentations from all stakeholders in material cycles and waste management, including product designers, operators, suppliers, environmental authorities, and academics internationally. Please come and join the 3rd 3RINCs and have a wonderful time sharing your knowledge and experience with people from academia, municipalities, and industry.